The most recent Christmas season is in the past, but I decided to choose this book from Blogging for Books because the story sounded interesting to me. It's a true story about a family (Mom and 3 kids) who experienced the devastating loss of their husband/father shortly before the holidays, and had no interest in celebrating them - at least no one except the young 10-year-old daughter who is portrayed as the positive thinker in the family. 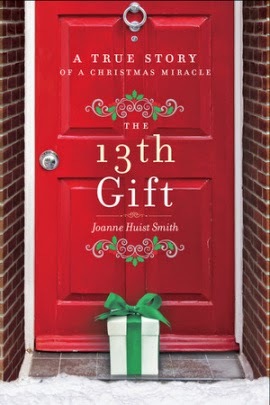 Then, a mystery developed as the family began receiving inexpensive, anonymous gifts for each of the 12 days before Christmas. Each gift coincided with the numbers in the "12 Days of Christmas" song. So, on the first day of Christmas, they received one poinsettia for the family. The second day of Christmas, they received two bags of Christmas bows. And, it goes on from there. The gifts were nothing elaborate or expensive - just a fun way to let them know they were being thought of during a very difficult time. By the time the 12th gift arrived, the attitudes of family had completely changed. They were once again excited about Christmas, and about sharing it with their family. They were also determined to find out WHO their "Secret Santa" was so they could thank them for all they had done. I received this book free from Blogging for Books for the purpose of this review. Thanks for another great review! !